I have always been an ardent supporter of The Miele Guide. Ever since its inaugural issue in 2008, The Miele Guide has helped place Asian dining at the forefront of the world culinary scene. Every year, the Guide assesses restaurants across Asia and lists not only the top 20 restaurants in the region but also the best restaurants in several Asian cities. Through a meticulous and unbiased system of selection, The Miele Guide highlights establishments that represent outstanding excellence in dining – Asia’s best by Asian standards. Last month, Ate Publishing, the publishers of The Miele Guide, asked me if I would like to try their latest innovation. Although the print version of The Miele Guide is already pocket-friendly, Ate Publishing, with the help of application developers The Dumpling Dimension, has created The Miele Guide iPhone Application. 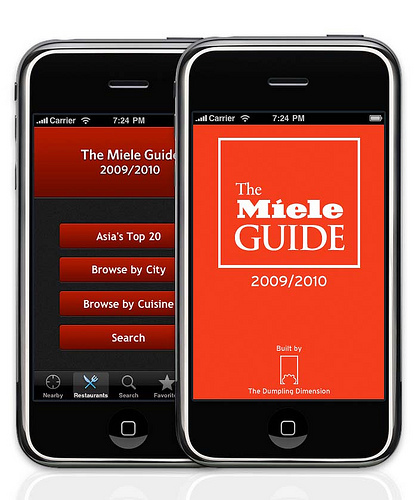 “The Miele Guide iPhone application provides iPhone users full access to the latest edition of The Miele Guide (in this case the 2009/2010 edition), whenever they want and wherever they are. Users will be able to search through detailed profiles of Asia’s best 450 restaurants, which include reviews and restaurant details such as its website, phone number, opening hours, and the accepted methods of payment. Functionality and simplicity were priorities in developing this stylish new application. A range of flexible search options makes finding restaurants a breeze. Users can search by the restaurant’s name; its ranking in the guide, location (city and country) or by cuisine. Calling a restaurant is just one tap away, and so too is opening up a restaurant’s website or finding it on the application’s preloaded maps. Users will love this application’s ability to plug into the phone’s GPS capabilities. With the application, foodies on the go will be able to detect their current location and get recommendations for nearby restaurants. Tapping on the ‘Map Views’ feature will then offer up easy to use directions on how to get to these restaurants. Further, through the application’s preloaded maps, users can, without having to eat up data charges, search for restaurants in any Asian city using the phone’s Map View, choosing where to eat based on location. The Guide for the iPhone and iTouch has raised the bar on the interactivity of the written word, providing a richer, more informative experience. It is an experience that is literally in the palm of your hand. The Miele Guide iPhone application is currently selling for US$ 4.99 at the Apple App Store via iTunes. Voting for the 2010/2011 edition of The Miele Guide is now open. Please click here and help place the Philippine dining scene on the culinary map.